Not exactly the cutest pair, but I thought this was worth mentioning anyway. 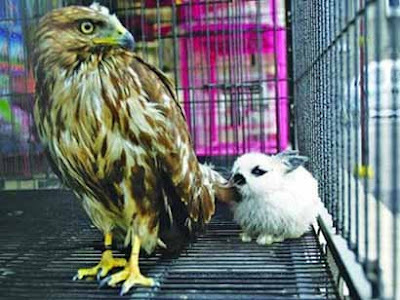 A rabbit and an eagle have become unlikely best friends in China. The owner of the eagle put the rabbit in its cage at Beizhamen Bird Market, Zhengzhou City, for the bird's dinner. But instead of following its predatory nature, the eagle made friends with the startled but fortunate rabbit. "The rabbit very humbly combs the eagle's feathers with its mouth," the surprised owner told Oriental Today.